Finding the best deals on local eateries in San Luis Obispo County can sometimes be a hassle. You can wait until Wednesday to get a coupon book, hear about a deal from a friend, or check out an app like Groupon. Now, Brett Foreman has created an app where all the best deals are at your fingertips. 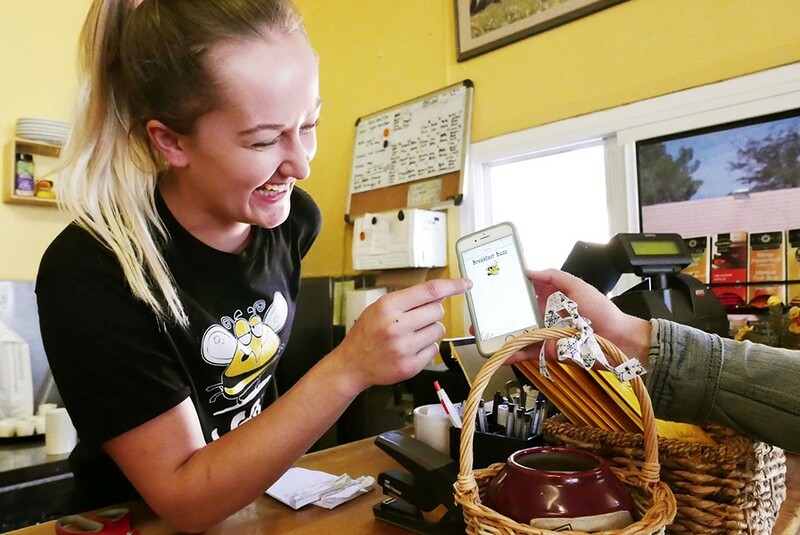 DISCOVERING DEALS Kick-it Points launched its soft opening at Breakfast Buzz in SLO where app users were able to claim a deal to enjoy their meal. "I told myself: 'Technology is only going to get bigger in all of our lives, but what's a way that I can utilize its strengths,'" Foreman said. Kick-it Points is a fun way to find great deals at restaurants from Pismo Beach to Morro Bay. The sleek and easy to use program opens up with a map full of pins in different locations notifying you of where deals can be found and redeemed. Click on a pin and it reveals instructions on how to obtain the deal. Claiming the deal can be as easy as walking into the restaurant or taking a hike to the top of Madonna mountain. The location settings allow you to claim the deal once you've gotten to the top of the mountain. Currently, 15 restaurants are sharing their deals on the app, the most being in the city of SLO. The main goal of Foreman's app is to combine technology and human interaction. He said it's like a combination of the apps Pokémon Go and Groupon. "With Pokémon Go, you would brush shoulders with people that have the same interests as you, and that's what I'm trying to do here, too. Not just the best deals, but getting people out there and participating in activities together," he said. Foreman is a fresh Cal Poly graduate, and after completing his education he wanted to figure out a way to stay in the area. "I thought I'd try to come up with a cool way to give back to the businesses and the people that have made my experience so awesome here," Foreman said. During his college years, Foreman, a business information systems major, shared a home with eight other guys and their meals were usually dictated by the best deals in town. "On Tuesday, my roommate would say 'Hey, let's go get tacos,' or on Wednesday is hot wings or other deals that are killer to the area," he said. Foreman said that he and his roommates also loved to grab a bite to eat after hanging out somewhere. That's how he decided to blend the two. "What better place than San Luis Obispo where in an arm's reach away there's great food and awesome things to do," Foreman said. "You can go surf, hike, and go to school in the same day, within a few hours." Currently, his app is marketed toward college students looking for the best prices in town. But he wants to expand his base to the entire San Luis Obispo community. Down the road, he hopes that his app will grow to include different cities in the state. But for now he's content with making sure the app works and reaches a large base of students and Central Coast natives. To learn more about the app or how a restaurant can participate in the program, visit kickitpoints.com.